With a stay at Encanto Casa Verde in Cienfuegos, you'll be a 4-minute walk from Palacio de Valle and within a 5-minute drive of Cinco de Septiembre Stadium. Free self parking is available onsite. When you stay at Villa Trópico in Jibacoa, you'll be on the beach and steps from Jibacoa Beach. Free self parking is available onsite. Located in Havana (Plaza de la Revolucion), Hotel Bruzon is within a 15-minute walk of Revolution Square and Jose Marti Memorial. 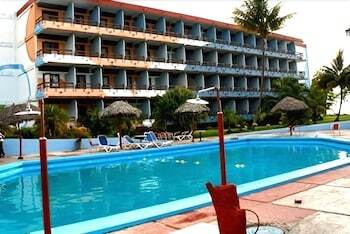 When you stay at Farallón Del Caribe in Marea del Portillo, you'll be steps from Marea del Portillo Beach.